Gibbs Smith Publishers, 9781586853334, 292pp. There's this boy. Let's say he's somewhere between nine and thirteen years old or so. You'd like to see this kid get creative. You'd like to see him get some exercise. You'd like to see him get out from in front of the television. And you'd love for him to be motivated enough to find some stuff to do on his own. This thick, durable book includes fascinating chapters on gross stuff, magic, emergencies, fireworks, games, experiments, jokes, activities, insults, pets, flying things, and, of course, duct tape. The Big Book of Boy Stuff has all the important information that boys just have to know: How can I make a rocket? What do I do if I get a bean stuck up my nose? How can I make lightning without killing myself? The veteran of many water-balloon wars, Bart King has twice won the prized "Arrested Development" award from the New York Society of Amateur Psychologists. He has been a middle-school teacher for the past fifteen years. This is his first book, unless you count that other one he wrote. 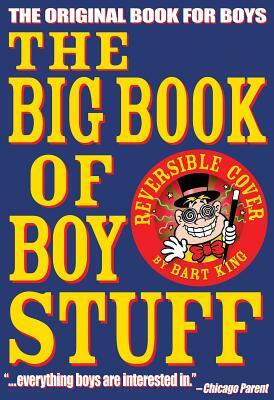 Bart has interviewed hundreds of the country's wisest guys and smartest alecks for the incredible material in The Big Book of Boy Stuff.